Japan has a rich culture and tradition which draws deeply upon imported, and later on, assimilated Buddhist beliefs and culture. The form of Buddhism known as Zen Buddhism took root in Japan during the Middle Ages and flourished thereafter. Zen Buddhism grew so important in the culture of Japan, until it underpins a lot of Japanese philosophy and thought right down to this day. 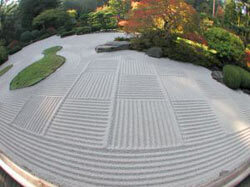 Among those daily activities affected by Zen Buddhism was gardening, and today, the Zen garden still thrives. 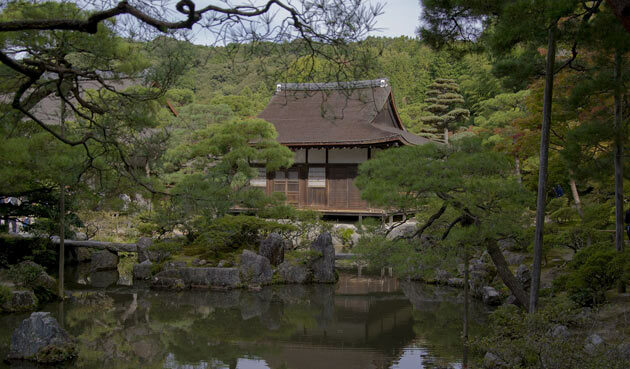 In Japan, Zen Buddhism lies at the core of all their aesthetic undertakings. The natural world is valued highly and the Japanese rock garden, or Zen Garden as it has come to be known is a large part of that tradition. Named Karesansui in Japanese, meaning dry landscape, these gardens are very prominent in Japan and much copied elsewhere. They are often to be found at temples where they are tended by monks, as in the ancient city of Kyoto. Ordinary households often have them too. In a Zen garden, everything in it has a meaning, although that is far from obvious to the casual observer. 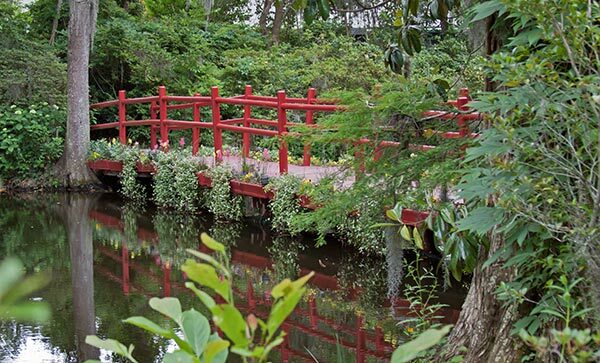 Zen gardens usually incorporate a lot of sand, pebbles, stepping stones, reflexology stone paths, and boulders. The rocks used are usually of different shapes and sizes, and strategically placed in select areas of the garden, sometimes on mounds of pebbles. Upon closer examination, the rocks, sand and design all blend together to create a hypnotizing effect upon the mind. 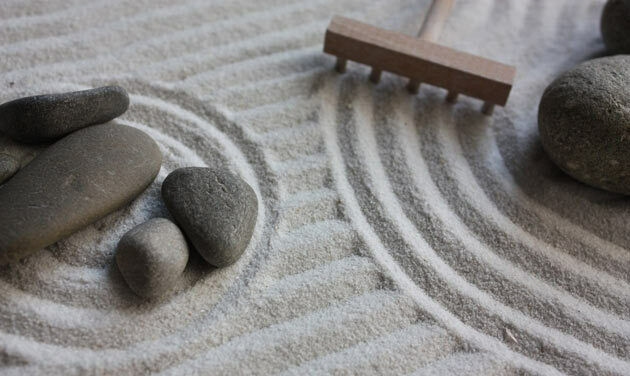 It is for this reason that a caretaker or keeper of a Zen garden often spends a lot of time raking the gravel every day in order to maintain the neat appearance as well as indulging in a form of walking meditation. 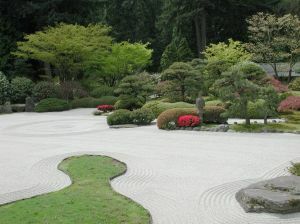 Zen gardens also incorporate hedges, miniature trees (bonsai), and ponds into their design. Even though there are Zen gardens without a touch of greenery present, as in just using gravel and rocks for the design, most Zen gardens do contain greenery that are almost always planted in neat, defined, and concentric zones. Ponds are also often seen in many gardens, and you can bet they are stocked with Koi carps; while little bridges and footpaths over the water invite the visitor to stop, and ponder on the water and enter into meditation. It is these elements that are significant in contrast to Western style gardens. Different interpretations exist as to the symbolism within the garden. Most experts agree that sand or gravel represents the ocean, the raking of patterns being done to signify ripples on the water. The rocks are normally seen, either as specific Japanese islands or Chinese mountains. Some people even claim to see animal forms in the rocks. Although the symbolism of the garden elements are not often regarded in the West, they nonetheless play a powerful role in inducing a mental state of calmness and reflection on whosoever visits the garden. By incorporating elements of abstract and solid ideas, the visitor is fascinated and drawn into the little oasis he is in, thus forgetting about the pressures of the outside world, at least temporarily. It is no wonder, that Zen gardening is blossoming in the West, and finding many new fans everyday. 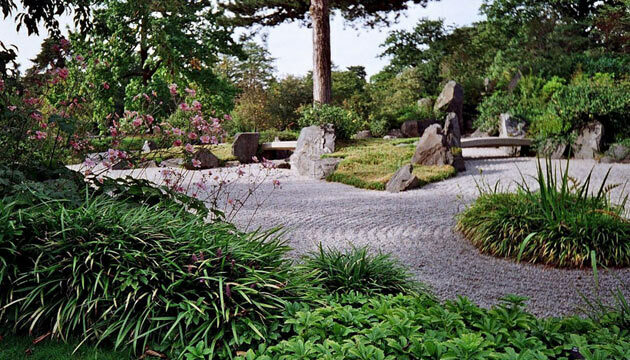 The beauty of Zen gardening is not only in their design, but also in their practicality. In Japan, land is sparse due to overcrowding; a Zen garden grown with bonsai trees is such a charming haven to delight in, for many Japanese people. Apartment dwellers can certainly do Zen gardening without much difficulty. A Zen garden can range in size from several dozen square feet to as large as you want, because size does not matter in Zen gardening. The important thing in a Zen garden is not the size of the garden, but the effectiveness of it in capturing the imagination of both the creator and the visitor, and in conveying its message of reflection, peace, equanimity and equilibrium.